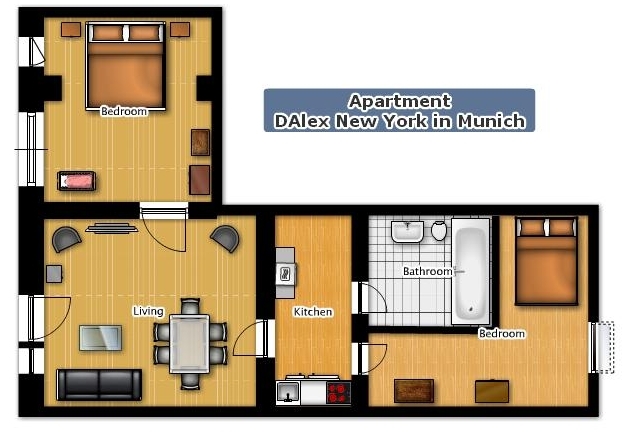 We are very pleased to introduce you to our apartment DAlex New York in Munich. This apartment is the result of our expansion into other areas of the city of Munich. Located in the Westend district, one of the traditional neighborhoods of Munich, originally an area of workers, now an increasingly appreciated area of the city, this apartment offers you an ideal place to spend your holiday or business trip to Munich. The apartment has two double bedrooms. On entering the apartment you will find a lounge-style living room, a comfortable space for relaxation. A 32" flat TV with national and international channels is available in this room. On your left is the master bedroom with a double bed (180 cm x 200 cm). Just behind the living room you will find the kitchen, equipped with everything necessary for you to make your meals at home. From the kitchen you can access the bathroom and the second bedroom. The bathroom is large and has a bathtub, sink and toilet. The second bedroom also has a double bed (140 cm x 200 cm). Bed linen and towels are provided. We have furnished this apartment with a modern design line according to the New York City. With black and white as dominating colors, resulting in a minimalist design that makes the space bright and airy places. We have spared no efforts and resources to achieve an aesthetically pleasing and functional environment for your stay. The apartment is located in basement level of an Art Nouveau building, which has been recently completely restored. Having big windows make the apartment very bright and well ventilated. Due to the backyard location the apartment is very quiet. The metro station Heimeranplatz (line U4/U5) is located about 250 meters away from the apartment. With the subway it is only 5 stops to the very downtown of Munich (Marienplatz). You can reach very fast every sight and interesting point in the city. If you come by car you will get a parking pass from us to park for free on the streets in the area.